Small businesses make up for a large part of the economy in many parts of the world, and in recent years, we have seen many businesses owned by Muslim women pop up. A recent statistic showed that 26 percent of Muslims run their own businesses in the U.S., while 23% employ more than 5 people. 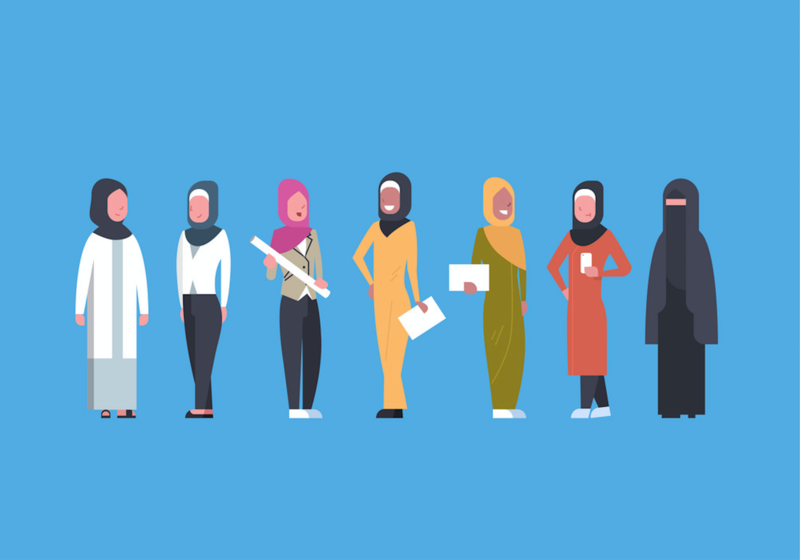 Though the proportion of that being women is unclear, it is quite evident that many of them are women-run due to the booming hijab and modest fashion industry. I founded my own business in 2016 called Infinitely Classic, creating powerful graphic tees that were ethically-made and designed by myself. A few months ago, I expanded my brand and started selling ethical, vegan, and cruelty-free liquid lipsticks. While being an entrepreneur myself, I love seeing other startups flourish, especially if they are owned by Muslim-women. Leena’s Hijabs is a hijab company geared towards young Muslim girls looking for beautiful, unique hijabs that match their outfits. Founded by Angie Hindy and her daughter Hana in 2018, the hijabs feature designs created by Hana. She paints beautiful patterns and has them printed on hijabs. While they are based in Canada, they ship worldwide and offer a variety of sizes for girls, and currently have a selection of matching hijabs for moms and older sisters. Leena’s Hijabs will be at Toronto’s very own Ramadan Market happening in April. Zuhoor Designs is a floral arrangement business founded by Bilqees Quick in Canada. Using strictly fresh florals, Bilqees creates beautiful arrangements that add uniqueness to any room. Whether it be a bridal bouquet, headpieces, or centre pieces, Bilqees tells a story through her arrangements that not only suit the place, but the person as well. While their arrangements are only available for people in the Greater Toronto Area at the moment, Zuhoor Designs is active on social media so you can support them virtually as well. They’re definitely a company to watch for due to their increasing popularity. Photography by Emma is a photography and branding business run by Emma Haider. Emma is an award-winning photographer, with photos to-die-for, and branding skills are on-point. She has been shooting weddings for over 6 years and has branched out to lifestyle and branding photography. She is a local photographer in Ottawa, and she offers her photography and branding services worldwide. Emma’s work is unique in that everyone recognizes her work from afar. Her brides, in particular, rave about being a #PBEBride. Reem from the Heart is a catering business as well as a cooking class service owned by Reem Ahmed. Reem was Canada’s first hijab-wearing woman on last season’s MasterChef Canada. While on the show, she won the hearts of so many people. She inspired many Muslim women to go for their dreams, and is passionate about uniting people with food. As someone who has tasted her food, I highly recommend getting catering from Reem, or booking her for a cooking class. She is beyond talented and her food leaves you wanting more. Ugasadda is a hijab and clothing company founded by Ugaaso A. Boocow. They offer [arguably] the most extensive colour collection of hijabs on the market. Any colour you’re looking for, it is there. They continue to stay on-trend and resonate with their fans and customers. They have a very honest social media presence that people can relate to. What attracts women to their brand is their accessibility, both cost-wise and size-wise. With a large following on social media, they’ve gained the support of so many while always offering impeccable sales and selection. Their products are available in several countries and they offer worldwide shipping. The Reminder Series was created by graphic designer and photographer, Hafsa Khizer. She offers custom and ready-to-buy paintings that are vibrant and include many Islamic references that leave people inspired. In addition to her impeccable paintings, she also offers classes. Her most recent classes were two painting workshops for empaths and introverts. As someone who has had the pleasure of attending one of her classes, I can assure you that she is an amazing teacher who was patient and thoughtful. She enabled me to tap into my skills and create a beautiful painting with meaning. Hafsa’s work has been deservedly featured by Productive Muslim and LaunchGood, just to name a few. Allyship vs. Ego: Which Will Win Corporate America Over? Mariam is an Egyptian-Canadian, aspiring Journalist and Entrepreneur who is passionate about politics and mental health advocacy through an equitable lens.